(BUP) There are 12 products. Buprenorphine: Brand names: Subutex, Suboxone, Temgesic, Buprenex. Street names: Subs, Bupe, subbies, oranges, sobos, box, stop signs. 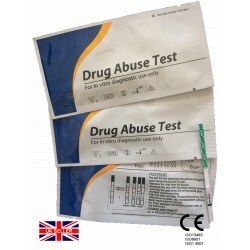 We stock a range of high quality, well designed testing devices for the use of Buprenorphine (BUP). Our tests are 99% accurate and will provide results in just five minutes. No urine will be handled with our tests. The design of our tests is made to contain any fluids whilst avoiding any possible spillage. The design of these tests are compact and convenient, providing the user with secure packaging, to ensure safe delivery. All tests are easy to use, with instructions provided on our website in the item's description. Items can be purchased in singular or bulk form either online of over the phone, want to put together a bundle? Call our dedicated help line: 0845 3881 543. Our quality customer service team will be able to assist you with any query you might have. Our stock levels are high enough to cope with huge demand. 100x Singular Buprenorphine (BUP) Rapid Strip Test.